The ball carrier walks up to the defender and turns away to present the ball to their own team. In a channel no wider than 10m, two attackers have 5 attempts to score a try on the red cones. This is a basic 2 vs 2 drill to allow players to progress from a simple 2 v 1. This is a basic 2 v 2 drill to allow players to progress from a simple 2 v 1. 10 is the ball carrier, advancing forward, before cutting in as shown in the diagram. This game is designed to teach the players about retiring to an onside position when a tackle is made. Drill to practice attacking from different positions. One player will straddle the bag and compete for the ball on the ground. Excellent drill to put defenders in game situations and having to make decisions. Four attackers, two defenders in quite a small playing area - trying to find space. Fun game to practice passes/kicks not being intercepted. Drill to practice passing laterally. Set up a diamond roughly 10m wide and 5m long (see diagram). Drill to practice attacking in a small channel. 3 Attackers line up opposite 2 defenders. Set out a square grid, at one end of the grid, separate four cones evenly - red, blue, blue, red. The aim of the drill is to develop wide passing. They should advance in 2's. 1. 1v1 in 5mx5m Grid. 1 player throws the ball up for one of the other player s to catch and the third player to put on a little pressure. 4 players start together on their stomachs next to each other. 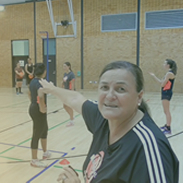 As the coach calls a colour cone, they move into position quickly. 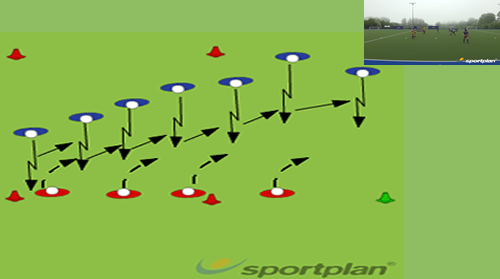 Out in 4s - simple hands - When players reach the end they should turn left. No of players: 4 per grid, max. 20. Simple game for players to work on their ability to side step and beat opponents 1 v 1. Four players start to run across the grid passing the ball. Lay flat on the ground. This is a simply set up game designed to test players' ability to continuously make tackles, especially when fatigued. Player with ball throws the ball up for player 2 to jump up and catch the ball. "wide to west" - the greatest rugby try ... ever! How can I prevent an overlap? Shortened lineup. Where should my forwards position themselves...? Only 1 defender in green zonesCan only score in GREEN TAKING IT ON;Once touched in 1 zone, have to score in the other.